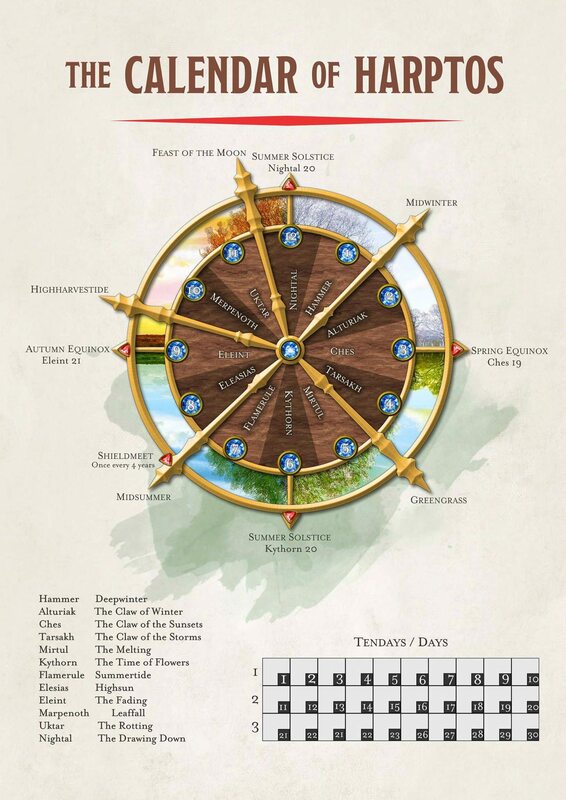 Created by Harptos, a wizard of some forlorn yesteryear, the Calendar of Harptos is used widely across Faerun and is considered by many scholars the best way to measure time in the realms. Simply put, he divided the year into 365 days, divided between twelve months of three tendays. A tenday, often considered an important measure of a passage of days, is much like a week on other Prime worlds. This only gets 360 days: the remaining five days are all between months, representing important turning points in the year such as Midwinter, Greengrass, Midsummer, Highharvestide, and the Feast of the Moon. It also marks the passage of years by a list of prophecized years. This is kept by the reckoning of scholars of the Dalelands, and thus is called "Dale Reckoning"; different regions, even in Faerun, may mark the passing of years differently. Each year is given a specific title, far in advance, and labeled as such. For example, the year the Time of Troubles began was known as the Year of Shadows, 1358; Mystra's death and the oblivion that was the Spellplague began in 1385, the Year of the Blue Flame (the Spellplague was blue). The current year is 1489, the year of the Warrior Princesses. What this means remains to be seen.